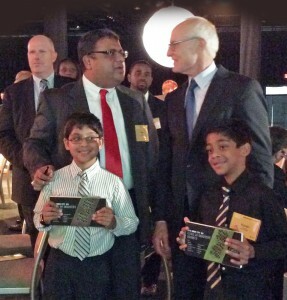 Max Kothari, CEO, Express Kitchens and his sons are congratulated by Harvard Professor Michael Porter at Inner City Awards ceremony held in Boston. The Initiative for a Competitive Inner City (ICIC) and FORTUNE announced that Express Kitchens was selected for the 2014 Inner City 100, a list of the fastest-growing inner city businesses in the United States. Ranking #4 in the Retail category with a 172% gross growth rate over the last five years, Express Kitchens has been in business since 2002. They are the largest kitchen cabinet supplier and countertop manufacturer in Connecticut with over 5000 kitchens already installed. Providing free 3D design services coupled with almost limitless kitchen cabinet styles, customization features and accessories, Express Kitchens has grown rapidly in over ten years of operation. Per Max Kothari, CEO, “we are a family owned and operated business — we are one of the largest cabinet suppliers in Connecticut, supplying the entire Northeast market. Producing and assembling our own cabinet line including laminate and granite counter-tops allows Express Kitchens to pass along savings to customers with monthly store wide promotions as well.” With current locations in Hartford, Newington, Waterbury, Hamden, Orange, Brookfield, CT and West Springfield, MA, Express Kitchens will be opening three new showrooms within the next year. Express Kitchens, having now close to 100 employees, increasingly competes with industry titans Home Depot and Lowe’s on service and quality, reported 2013 revenues of over $14.5 million. This year, for the first time in the list’s 16-year history, the Inner City 100 consists of 10 fast-growing businesses from 10 industry categories. The 10 industry categories are: Construction; Manufacturing; Professional Services; Food and Beverage; Retail; Media and Communications; Software and Information Technology; Transportation and Logistics; Healthcare and Biotechnology; and Arts, Entertainment, and Recreation. Applicants ranked according to revenue growth against their industry peers, as well as overall. Express Kitchens ranked 67th overall on the list of 100. The Inner City 100 program recognizes successful inner city businesses and their CEOs as role models for entrepreneurship, innovative business practices and job creation in America’s urban communities. The 2014 Inner City 100 winners represent a wide span of geography, hailing from 53 cities and 23 states. The winners grew at an average compound annual growth rate of 39 percent and an average gross growth rate of 336 percent between 2009 and 2013. Collectively, the top 100 inner city businesses employ 8,276 people and have created 5,119 new jobs between 2009 and 2013. Not only are the winners powerful job creators in their communities, they also help develop their employees – 73% provide business skills training and 69% provide professional development training to all full-time employees.